"He has a raspy mumble of a voice that at times echoed George Jones." "He displayed an ease and comfort in entertaining 60,000 people that made it look like he's been on that stage dozens of times before." 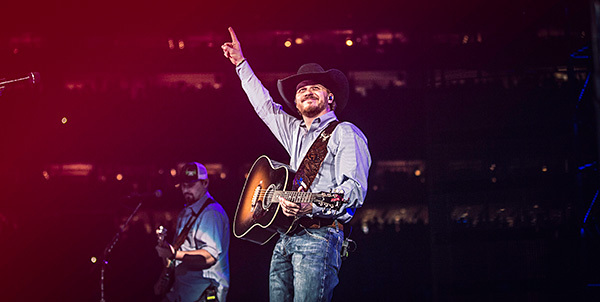 Wednesday night touring powerhouse Cody Johnson made his debut as headliner at Houston Livestock Show and Rodeo™. Johnson moved more than 7,500 hard tickets in less than 48 hours immediately following the announcement that he had been added to the bill. In front of a crowd of over 60,000, Johnson turned in an electrifying set that whipped the audience into a frenzy and an hour long singalong. Fans burst into song numerous times during his set that included classics "Me And My Kind," and his current Billboard single "With You I Am." When Johnson sang his breakout hit "Texas Kind Of Way" the deafening and over-the-top response from the crowd literally stopped Johnson in his tracks and brought him to tears. Johnson was truly moved, "I've been wanting to play here my whole life. For a kid who grew up in the shadow of the Astrodome…it's a dream come true. It's pretty surreal to get the call." In true cowboy style, and the delight of a smitten crowd, Johnson took a page out of George Strait's book riding out of the stadium on horseback. Rave reviews have been pouring in online from fans, the media and promoters. "Cody Johnson was incredible at his Rodeo Houston debut! His performance surpasses his reputation!" - Jason Kane, Houston Livestock Show & Rodeo Managing Dir. "He has a raspy mumble of a voice that at times echoed George Jones. It adds a layer of sincerity to his songs, including "I Aint Going Nowhere Baby," "Ride With Me" and "The Only One I Know (Cowboy Life)." The former rodeo rider and prison guard made the most of the opportunity and turned NRG Stadium into the world's biggest honky-tonk." "Center stage at RodeoHouston can be an intimidating prospect for even the most seasoned performers. So to be ready to take that stage for the very first time with less than 48 hours notice is a tall order indeed. Cody not only stepped up to that challenge, but he displayed an ease and comfort in entertaining 60,000 people that made it look like he's been on that stage dozens of times before. Exiting the arena on horseback, he left those in attendance with the kind of concert experience that will be talked about for years to come and those who weren't wishing they'd been there to see it in person."